Stellar Four: Help, I Got A Kindle For Christmas! Help, I Got A Kindle For Christmas! My sister handed me a gift on Christmas morning. It was light and thin and wrapped in paper with penguins on it. Being the child that I am, I shook it. The look of abject horror on her face made me stop. Carefully I unwrapped it and found myself with a matte black box. "The hell?" I said. 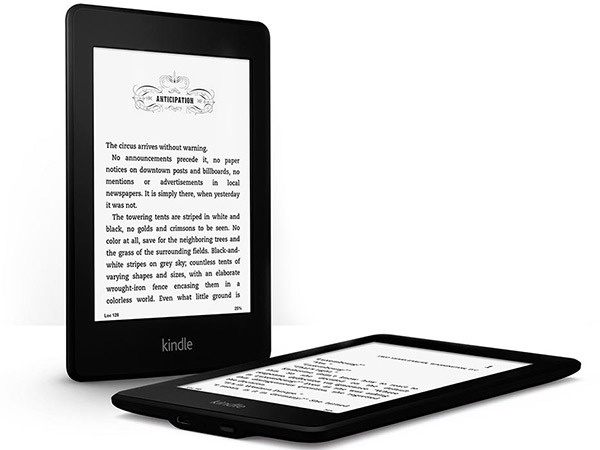 I turned it over and saw the words "Amazon" emblazoned on the front and, on the side, "Kindle Paperwhite". My expression can only be described with emoticons. My face basically became "O_O" as I stared at it. My sister, who had just become the proud owner of her own Kindle a few weeks prior, was overjoyed. I had spent a few days torturing it for answers playing with hers and now, she cheerfully informed me, I had my own. The best one. Top of the line. As every reader of the blog knows, I am pro-paper books in the age old e-book vs paper book battle. Even on this very blog, I've expressed dislike, distrust and outright hatred of these little devices. They're harming the book industry! I like the smell of paper books! The feel of them! A screen just isn't the same! My first impressions were ones of surprise and cautious curiosity. It was so LIGHT, so SMALL. How can you read on this? It feels like nothing in your hand. Even my iPhone weighs more than this thing. I turned it on and it cheerfully helped me get started, leading me by the hand and congratulating me on a job well done once it was set up properly. There was even a letter, addressed to me, thanking me for registering the device. I'll admit, there were some warm fuzzies there. It made me feel like I had just adopted a puppy or something. This Kindle had a home! A name! It loves me! I'm a sucker for that stuff. Gosh darnit, it was just so POLITE. I loaded on some free books, as well as paying for two e-books I had been dying to read, and took it with me on a trip that same week. Sadly, this is when the honeymoon ended. In the real world, the Kindle was uncomfortable to hold and I was constantly afraid of dropping and breaking it. The light was either too bright or too dim or the angle of the screen caused a slight glare. I never could immerse myself in what I was reading, I was constantly reminded that it was an e-book. I quickly retreated back to the warm and loving pages of a paperback. Perhaps unfairly, I named the Kindle Fester, after Uncle Fester from the Addam's Family, since it lights up (almost all my electronics are named after the Addam's Family). After I finished the paperback, I decided to give the Kindle another shot. I brought Fester with me to work and found myself again afraid of harming it. It's an expensive device and it feels so delicate. I even got it a sturdy Amazon-approved case and I still can't shake the idea that I could harm it. I never have to feel that way with a paper book. Reading on the train was again a trial. Again, it felt wrong in my hand and I was often jarred out of the story. The morning commute was rough and Fester failed to impress. Coming home and rather exhausted, I found myself more able to sink into the story but I still put it back in my bag like it was a flat Fabergé egg. Tell me about your experience getting used to an e-reader. Is this normal? Will I ever learn to love Fester, or is he destined to sit on my desk gathering dust? What should I do to make this easier? You'll learn to love Fester if you have reason to travel--being able to bring dozens of books with you without weight is so, so lovely. And maybe if you have reason to read in the dark. For me, though, I think being able to modify font size was the big turning point. Reading at night, my eyes feeling tired, turning up the font size and being able to comfortably read for another hour was so pleasant. Ooh, and both my books and a short story I wrote are going to be free tomorrow on Amazon. If you like fun, fast-paced ghost stories and/or are a geeky romantic who doesn't mind implausible physics, you should add them to your free pile. It will get bigger and bigger over the next few months. I guess having dozens of book options at any time (seriously, my TBR pile is a mountain) is another advantage! I am going to make it my mission to find you so many book deals you'll be drinking the eBook kool-aid in no time. OK I love my books. The feel and smell and all that and I will never get rid of them. Having sad that I love my Nook. First, instant gratification. It takes seconds to buy and download a book. A lot of times the ebook version is cheaper too. And I can bring hundreds of books with me at once. Also I have dropped mine MANY times and it is fine. I have SO many paper books I haven't even GOTTEN to yet, so I'm sure I won't ever abandon them. I know for a fact there is a good amount of books coming out in the future I want in paper version too, like Neil Gaiman's new book. That said, $1.99 for a book ain't half bad, especially if it's a light fluff piece that I probably won't ever revisit. You need to buy a cover - one that opens like a book. It wasn't until I felt that it was safe that I could relax and read. I find mine is very, very useful when I travel. I don't worry any more about running out of books! Kindles survive pretty well. Mine's been dropped onto driveways and scratched a little, and only covered in vandalised socks/other thin pouches. My first experience- I turned it on and was amazed at the fact that such a little device had could fit so much stuff onto it. I find kindles are useful for taking on holiday (though I wouldn't recommend trying them out at a beach). Finally, no matter how much you love your kindle, I'm sure you'll still love paper books. For me, it's the story, not the format. Hope Fester grows on you!